Can Ear Wax Cause Tinnitus without Hearing Loss? It is possible that ear wax can lead to tinnitus – a condition where a person complains of hearing sounds in the ear in the absence of any actual external sounds. Such sounds in the ear could be some type of buzzing sounds that can differ in intensity and pitch from person to person. It is however important to remember that ear wax would be one of the simplest of reasons why tinnitus can occur. In order to eliminate some of the more serious causes of tinnitus a proper medical checkup is recommended. Tinnitus is often a symptom of other health conditions and these could range from a mere situation of ear wax or something more complicated. Presence of excessive ear wax is capable of partially blocking out sounds from the outside. This in turn can magnify subtle noises of body functions inside the ear canal. This type of sound can be immensely disturbing because of their constant presence. These sounds can be so overpowering that a person’s daily life can be severely compromised. Many develop psychological problems of anxiety and stress. Many times sleep can be a huge effort simply because the noise in the ear won’t go away. Self cleaning of ear wax can sometimes lead to complications if done excessively or harshly. It can lead to inflammation of the middle ear or perhaps even of the ear drum itself. Tinnitus arising from these circumstances is different from the Meniere’s disease which is mostly accompanied by hearing loss. Tinnitus which results from over scraping of ear wax can cause infections in the ear canal and result in producing a hissing, ringing or buzzing kind of noise in the ear. Improper removal of ear wax is also likely to inflict damage to the cochlea region in the ear and result in producing irregular sounds. 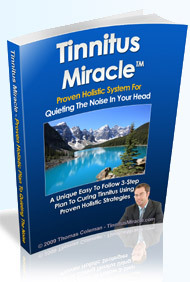 Extreme care has to be taken to find the real cause of tinnitus and find the correct solution thereafter. If the condition of excessive ear wax is serious then it is safer to pay a visit to an ENT specialist for correct methods of era wax removal with the use of instruments. Thereafter it is imperative to follow a holistic treatment of the body to make sure that ear wax related tinnitus does not recur.